Today's version of fit is not the same as it was 20 or 10 years ago. With Cross Fit becoming mainstream, whole body fitness has become the norm. 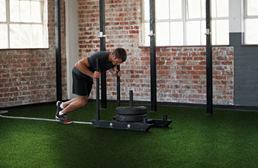 With our gym turf, you can transform your workout area into a space that people will be able to work out their whole body in challenging, fun, and varied ways. Clink, clank, back in the day that was the typical sound that you would hear at any gym across the country. A bunch of hulked out guys throwing around weight. Well, now, that it is frowned upon to look like Barry Bonds or Arnold in some circles, the sounds you here now are swooshes and snaps. Commercial gyms have come a long way from the days of when Arnold was tearing up the fitness circuit. 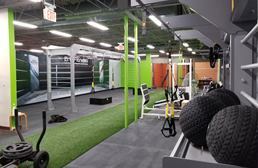 With the advent of Cross Fit, gyms are more about than just people trying to look like the Hulk. People want to be healthy and do it in ways that are different, interesting, and fun. 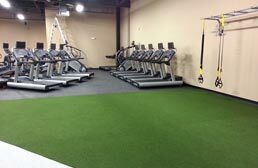 Gym turf or sports turf has been one of the biggest driving forces in creating spaces where one can vary up their workout regimen. 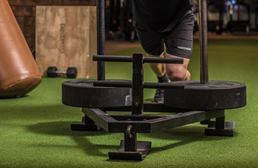 From pulling or pushing sleds to conditioning drills, one can get a full body workout on a surface that is durable and easy to maintain. 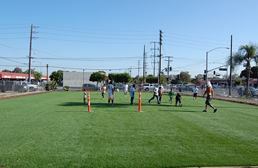 With real grass, there are a lot of hurdles. 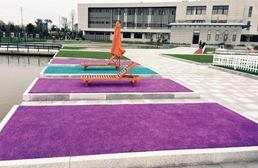 One of the main issues you run into is that grass doesn't grow well under fluorescent light. The next hurdle is the cost of maintaining grass. From watering it to cutting it, grass can cost thousands of dollars to keep looking great and performing top notch. No one wants to pull a sled over mud patches! 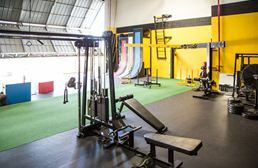 So now that you are interested in purchasing turf for your gym, the first question on your mind is how do I know which one to choose? 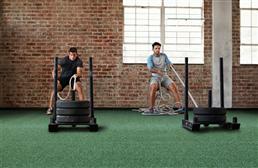 For gym turf, you will want to pick a turf that has a low pile. This ensures that your sled will slide with ease and will eliminate a trip hazard. Also, the lower pile height will ensure that your turf doesn't look like a sled has been running over it all day every day. 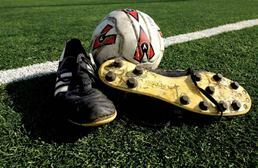 The main metric used to determine how durable your turf is the face weight. So what is the face weight you ask? 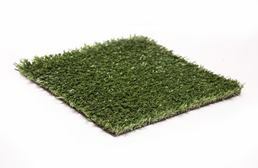 Face weight is the amount of material used to make the turf. The higher the face weight, the more material used, thus a more durable product. So if you have a gym where the turf will get used a ton every day, make sure you get a product that has a higher face weight. 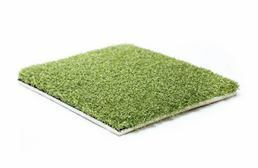 The next thing to consider when buying your gym turf is the height of the turf compared to any other flooring surfaces you will have this installed next too. No one wants to trip going from one station to the next. People want to hurt leaving the gym but from a great workout, not from a fall. All thicknesses will perform the same, so it is not a determining factor when it comes to actual performance. 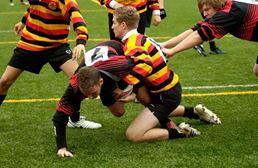 Also, sport turf rolls can come with attached padding. 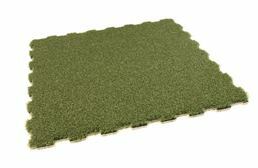 This padding helps to add extra height to your floor while also providing comfort underfoot. One of the last factors when picking a gym turf is where the turf will be placed. 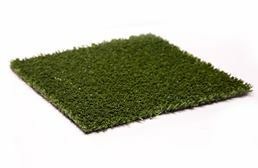 Gym turf comes in both indoor and outdoor versions, and if you are looking to put the turf outdoors, you will want to purchase an outdoor rated turf. 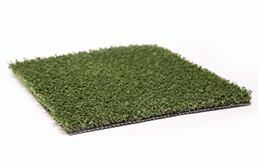 You can use and indoor turf outdoors, but the turf will fade over time and may not hold up to the elements as well.